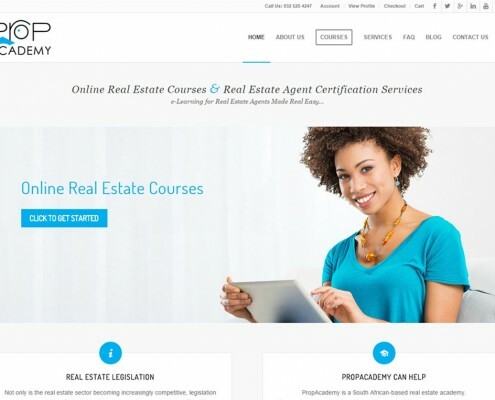 PropAcademy is a new start up offering online courses for Real Estate agents in South Africa, with the goal of becoming the #1 player in the local real estate industry. They tasked us with building a robust online learning platform where students can easily purchase courses online and complete them from anywhere in South Africa. The platform needs to be easy to use, and work on any device, from mobile phones and tablets to desktop computers. 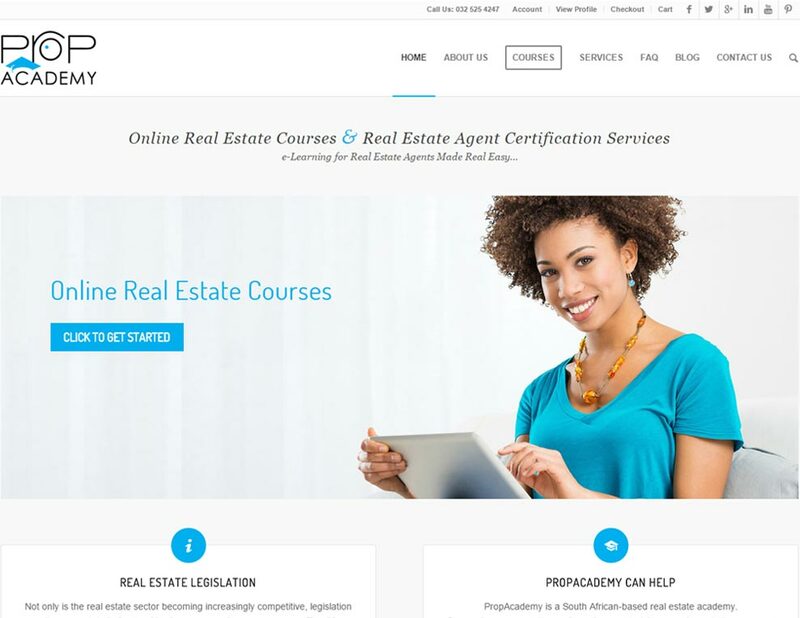 They also needed a professional looking public facing marketing website to promote their courses and services that’s user-friendly, well optimized for SEO and performs well across all devices. 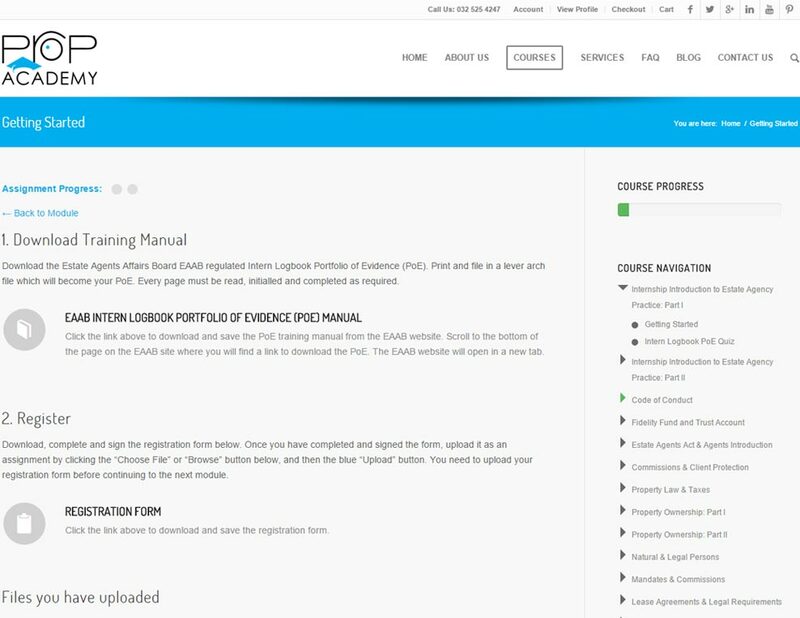 Since the brief called for both a well optimized marketing website and a user-friendly, easy to manage online learning platform, we decided to integrate both platforms into one WordPress website using the LearnDash LMS (Learning Management System) plugin for WordPress. 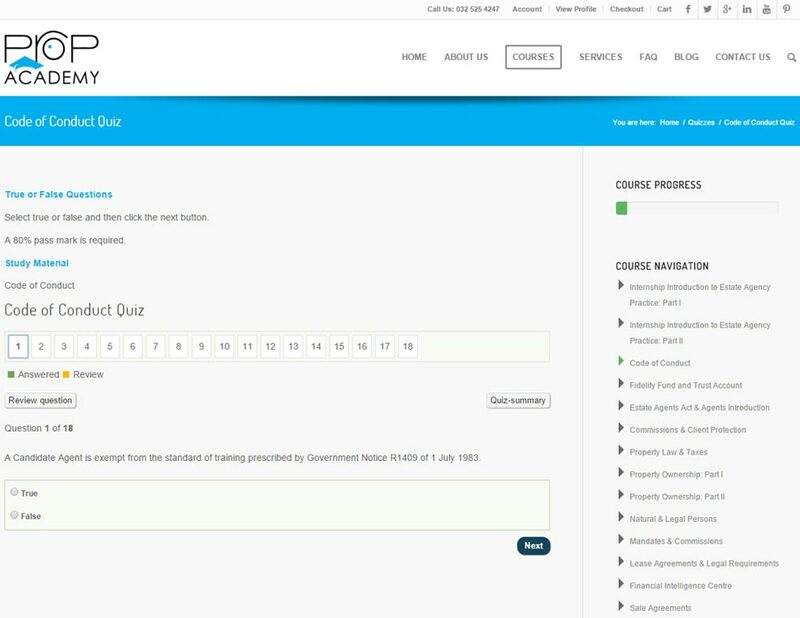 This turned out to be a good decision over using Moodle for the LMS, as the result is a seamless integration between the two primary functions of the website, a consistent look and feel across both platforms, and the simplicity of only having one admin area to manage. 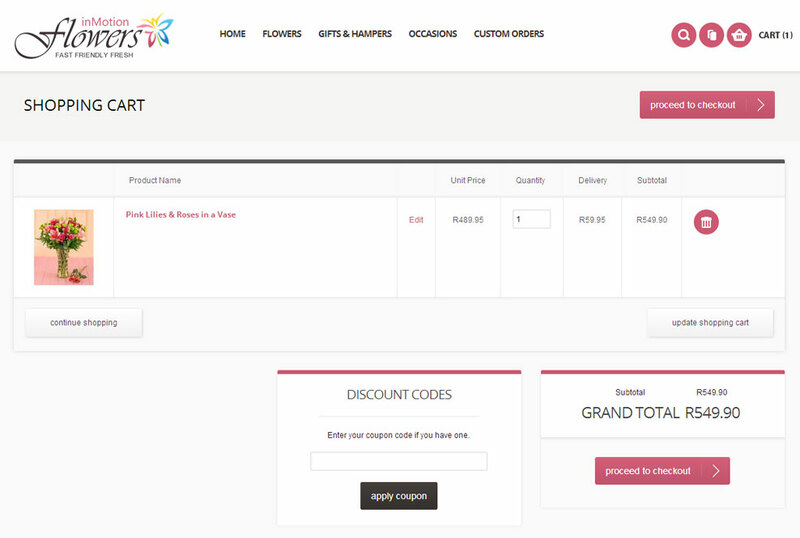 Since the students need to be able to purchase the courses directly on the website, we added e-Commerce functionality using the popular WooCommerce plugin for WordPress, which we then integrated with the LearnDash LMS. 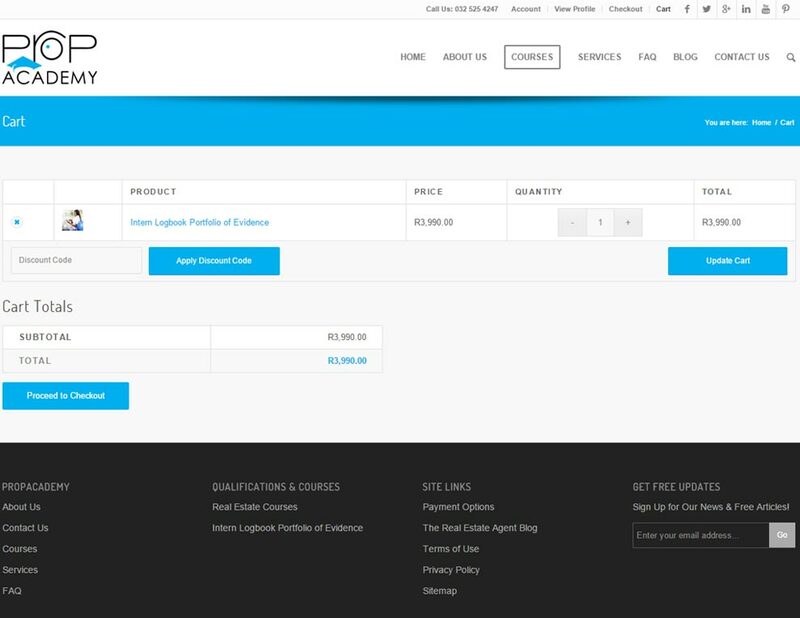 This integration enables students to purchase a course online and automatically be enrolled in the course once payment is received. Course progress is tracked in their account and on their profiles, and badges and certificates are awarded on completion of each course. 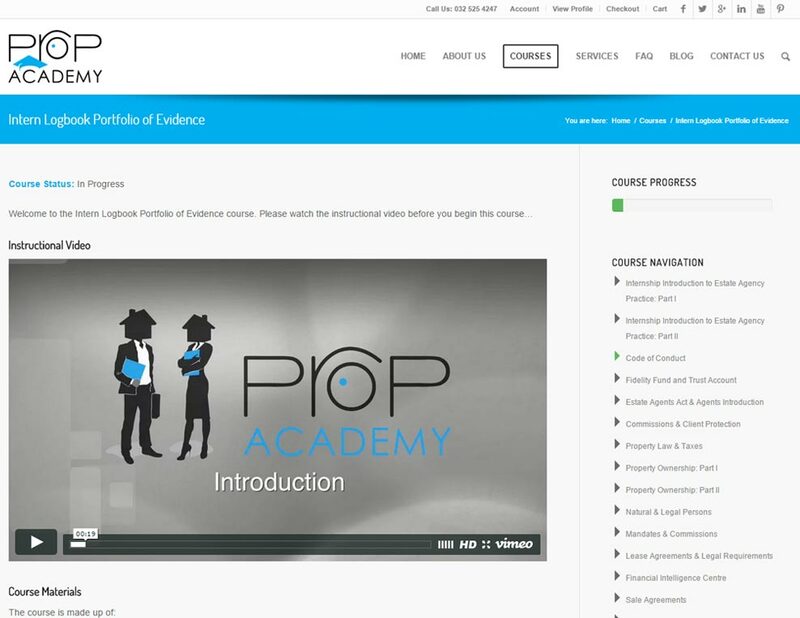 The course material was provided by the client, from which we produced engaging online courses that include videos, manual and template downloads, quizzes and the ability to upload projects to the platform. We baked SEO best practices into the design and development process from the ground up, and we added a blog to help their SEO and content marketing efforts. The blog will also be used to share useful information and tips with students and the general public, and we may add a forum at a later stage for users to share information with each other. We also built an event calendar into the system to track scheduled webinars and events, and they will be making use of our online survey tool to gather valuable feedback about their courses and grow their email subscriber list. Furthermore, PropAcademy has engaged us to provide ongoing maintenance, support, SEO and internet marketing services to ensure they reach their goal of becoming the dominant player in South African market. This project lies close to our hearts since it’s one of our own brands. 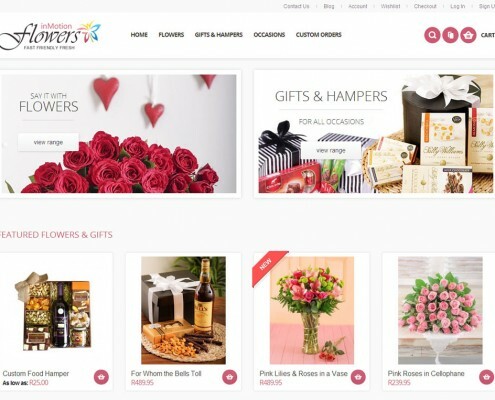 inMotion Flowers is a premium online florist selling flowers, hampers and gifts in South Africa. 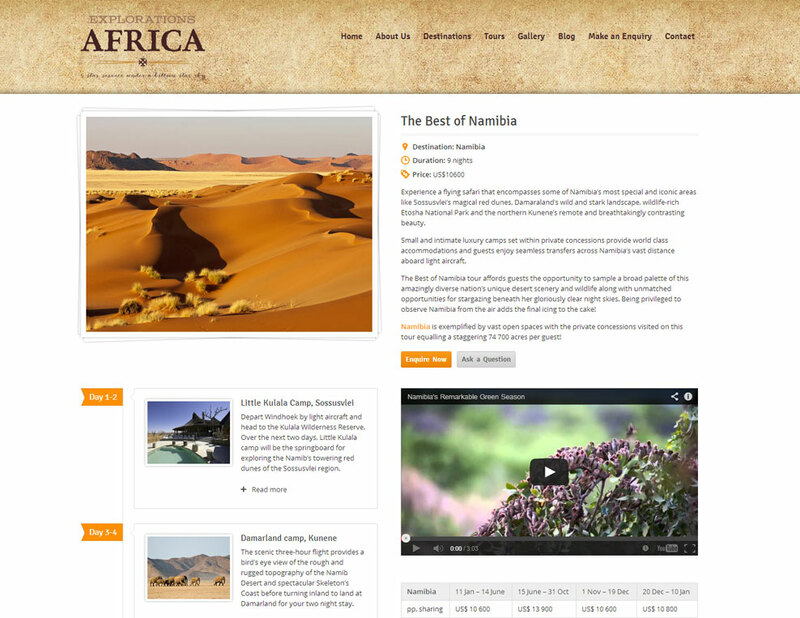 We’ve been trading online as Flowers for Africa since 2010, and had originally developed a highly unique custom built animated flash website. At the beginning of the year, we decided to rebrand our business to inMotion Flowers, and along with that, develop an entirely new website. We needed the new website to be well optimized for search engines and highly compatible on the fast growing mobile platform (mobile responsive). We also wanted it to be attractive, clean and fresh looking, while still containing elements that reminded of our old flash website. We achieved this by making extensive use of AJAX for the various animated elements, which has also helped distinguish us from our competitors. Our first step was to build and launch the new website. 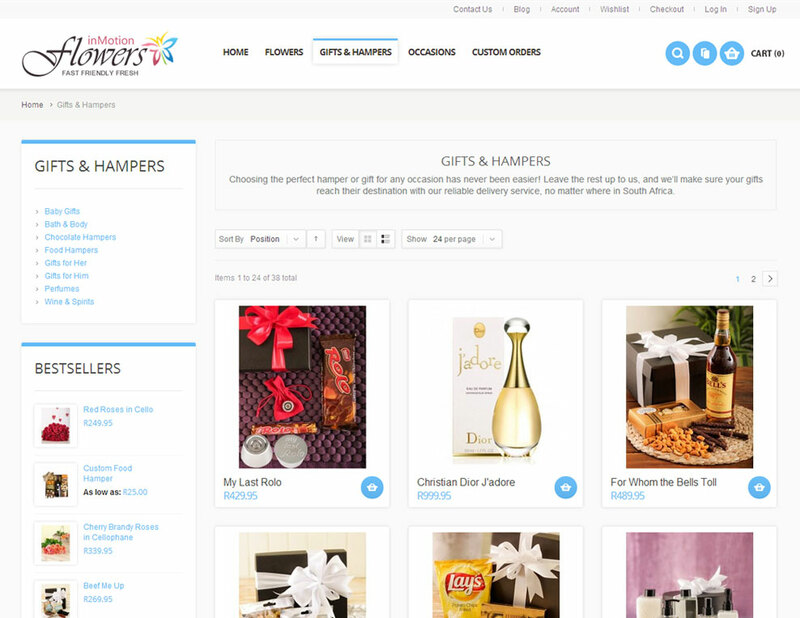 We chose Magento, a powerful open source e-Commerce platform, primarily for its ability to scale and be customized. The biggest challenge was developing a custom checkout system to accommodate the unique requirements of our business. We implemented on page SEO as we built the website and catalogue, and made it mobile responsive, which is showing very good results. To assist with our SEO and internet marketing strategy, we integrated a WordPress Blog into the Magento platform so that we can provide value to our customers and grow our audience. We are also using the blog to attract links and social signals, which has helped our rankings. Once the new site was live and our customers were used to the new look and feel of the site, we started the process of rebranding. This involved designing a new logo, moving the entire site and database to a new server and redirecting the old site to the new one with a slightly different URL structure. The entire process went smoothly, and the results have been great. 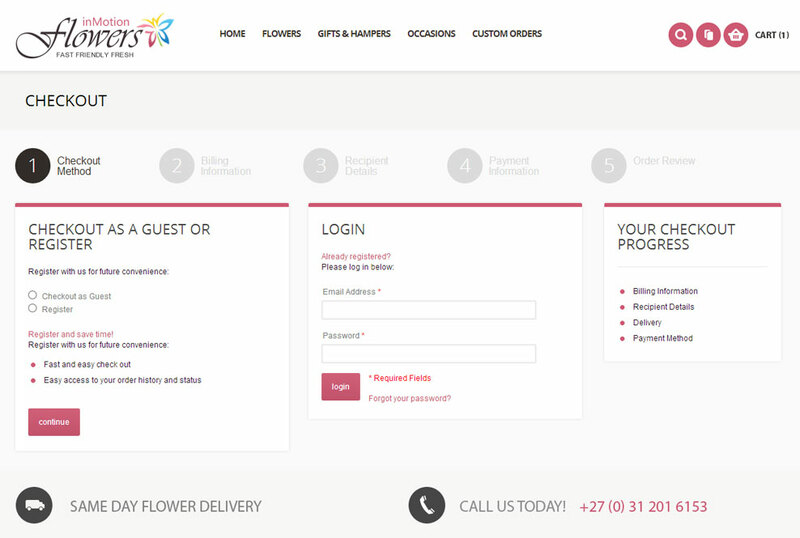 At the beginning of the year we decided to rebrand one of our web properties from Flowers for Africa to inMotion Flowers. For this, we needed a new colour pallet and logo that would match the more modern looking website we were developing. We designed a logo that reflected the friendly, personalized nature of our business. We used black in the main logo type to give it a classier look than our old logo had, and brought our main theme colour into the inMotion part of the logo type to tie in with the brand. We incorporated the rest of our new colour pallet into the logo icon, which gave the entire logo a friendly and casual feel. It also stands out nicely as a profile image on our social media profiles. 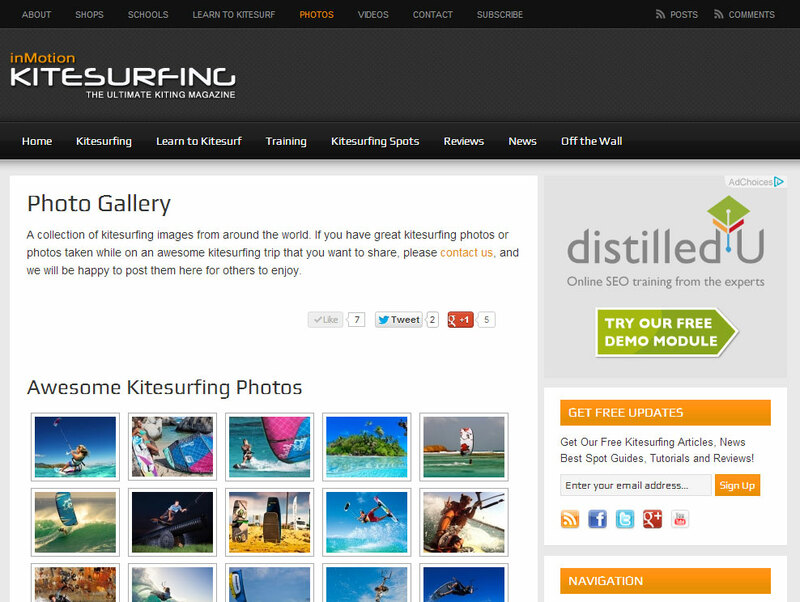 As the name suggests, inMotion Kitesurfing is one of our own brands. 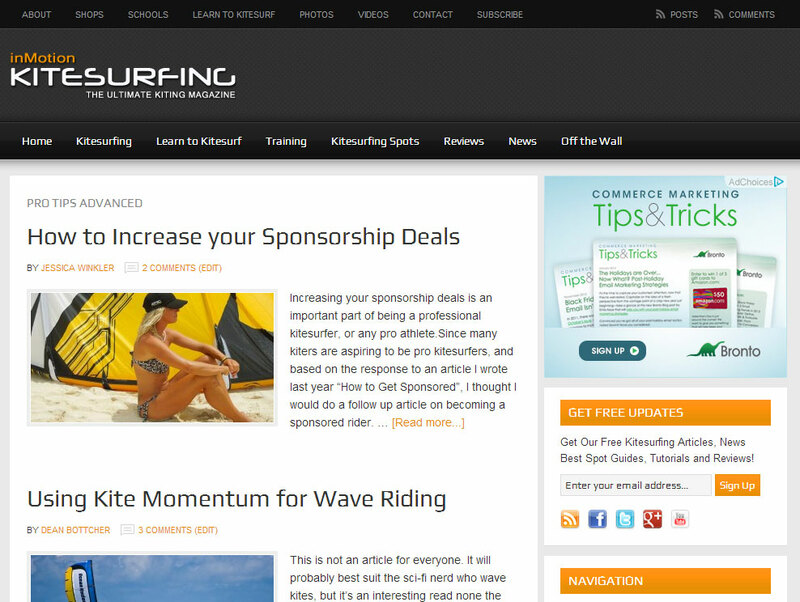 The site is a well respected online kitesurfing magazine website that publishes valuable educational, entertainment and news content related to kitesurfing. We first launched the site in March 2011 and by August 2012 we had outgrown our original site in so many ways. So it was time to rethink our web strategy, and launch a completely new design and navigation structure. Our main focus was making the new site less cluttered, and easier to read, since the primary purpose of the site was for consuming content. We also wanted the website to be mobile responsive so that it was easier to read our articles on mobile devices. Another important goal was making it easier for people to subscribe or follow us. So we focussed heavily on integrating social sharing tools and a subscribe form at the end of every article and important pages. 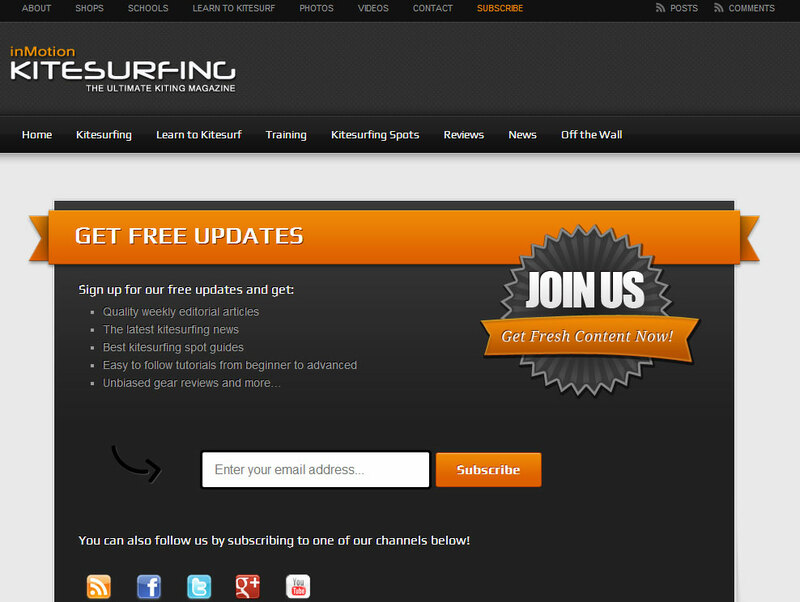 We also beefed up our subscribe to updates page. 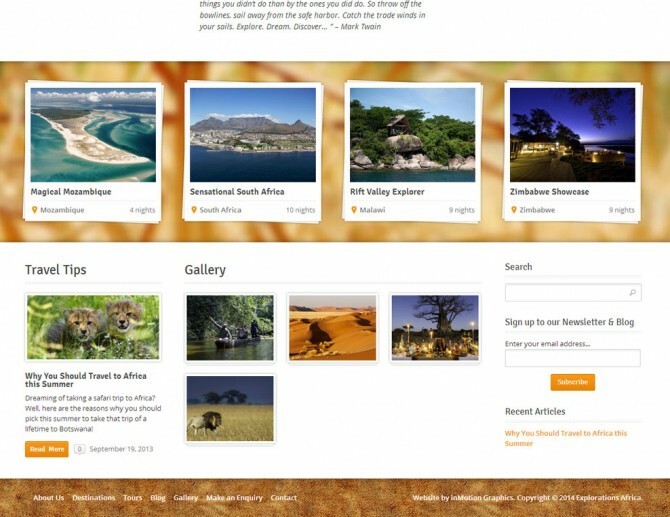 This website is built using WordPress, the world’s most popular open source blogging platform. For the new site, we converted to the Genesis framework take advantage of improved performance and SEO. While building the new website, we made changes to the navigation structure to improve usability, and we paid close attention to SEO in everything we did. To help with our SEO and internet marketing strategy, we made it easier to share our content, which has helped our rankings significantly. 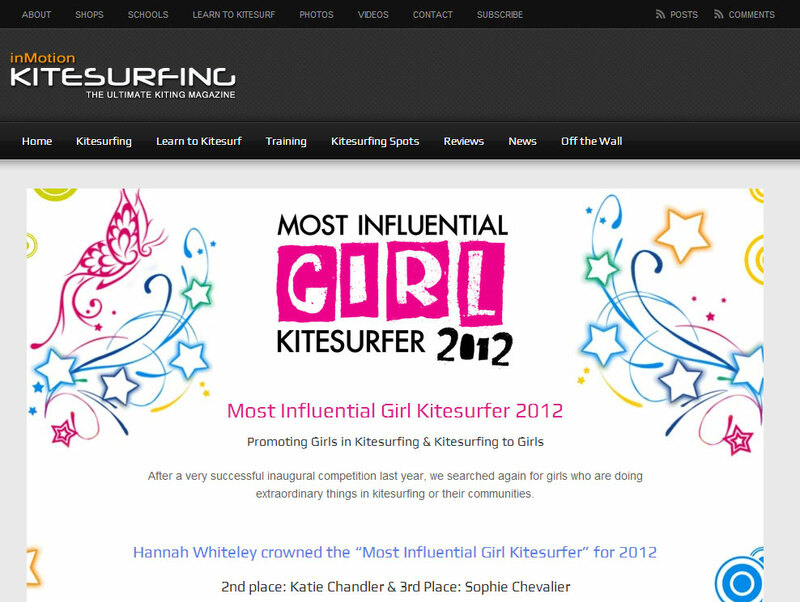 We also improved the design and technology behind our annual “Most Influential Girl Kitesurfer” competition, which we run as part of our viral marketing strategy. This year the competition page alone received over 2500 Facebook likes and shares, and a total of 9,135 votes for the competition. Suffice to say, this was a hugely successful viral marketing campaign for us. Overall, the new design was very well received by our readers, and the site has been driving a lot more targeted traffic. 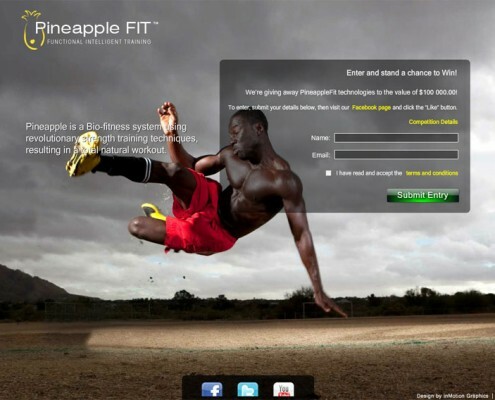 PineappleFit is a new brand of core strength training techniques and equipment in the USA. 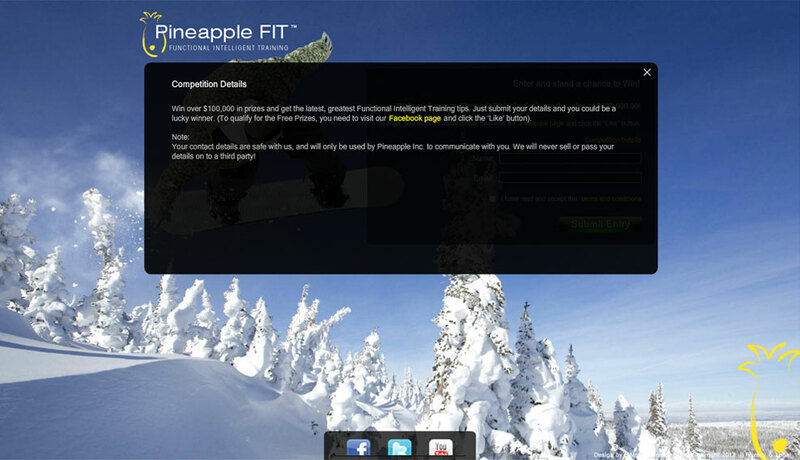 Our California based client wanted a website to host an online competition they were running. The website needed to reflect the energy, passion and enthusiasm of the brand, and convey the action of the extreme sports the company caters to. 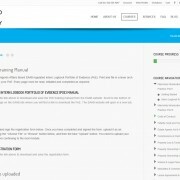 Our natural choice for this website at the time was to build a full flash website in HD, with fullscreen functionality. To convey the action and excitement, we made the high definition extreme sport images span the full width and height of an HD screen, with the content of the website in the foreground. To ensure the website displays correctly on smaller screen sizes, we built the site so that it gracefully scales down to fit any screen size. The individual elements on the page scale and move independently to ensure a fluid layout. Since this was for a competition, we integrated an entry form and a few info boxes that load over the images. We also integrated social media to aid sharing and help them grow their following. 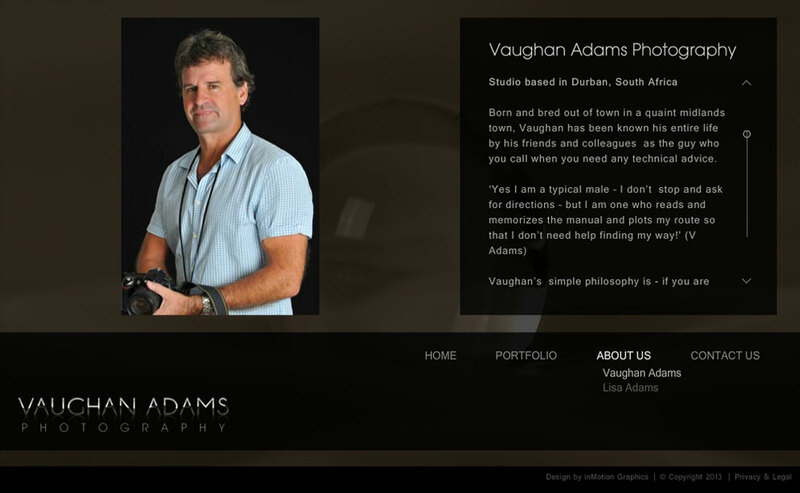 Vaughan Adams is a well respected food photographer in Durban, South Africa, and wanted a cutting edge website that would showcase his photography work from its best side. We knew the website needed to be clean and sophisticated, yet understated at the same time. 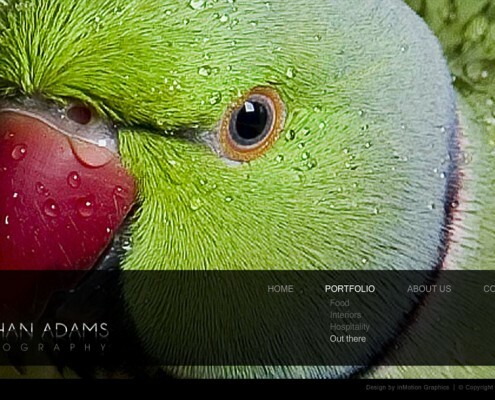 His creative imagery needed to take centre stage, and the website needed to set the tone for his beautiful portfolio. We decided that the best way to present Vaughan’s work was to make the entire website the photos. To achieve this we decided to get rid of everything the user didn’t need while viewing his portfolio. We did away with the traditional menu, footer and page borders, and instead made the images the defining container for the site. This enabled his images to be larger than most portfolio websites offered at the time. The menu appears over the images when the user hovers over the image, which enables them to navigate the site. In the same way, a toolbar appears at the top of the page allowing the user to switch to fullscreen mode (to get rid of clutter from their browser), control the slideshow and mute the sound which was added to set the mood. 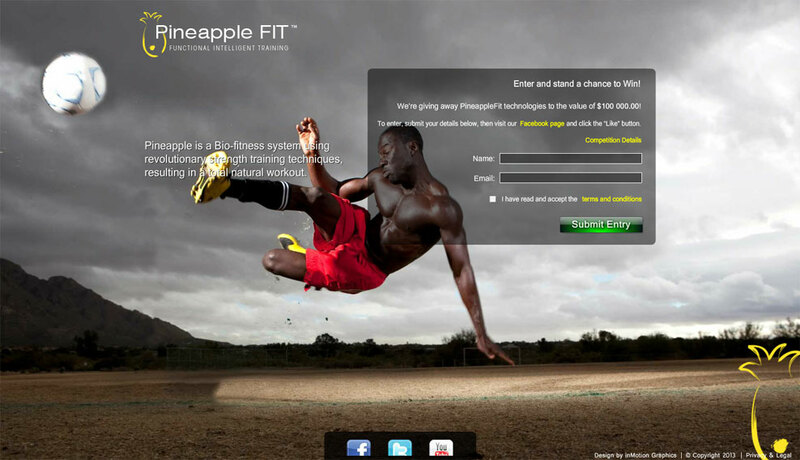 This website was custom coded entirely from scratch using flash and ASP. Since the images that needed to be loaded were relatively large, and we wanted the website to load quickly, we built the site so that the user only ever waits for the first image to load. The next image loads while the current image is displaying. The transition only takes place once the next image has loaded, so no matter how slow a user’s connection is, they never feel like they are waiting for a page to load. To give the site a slick feel and to maintain continuity, new content is loaded into the main website container instead of reloading the entire page, and pages transition with a fade animation. We also added acceleration to the scrolling text to further convey this smooth slick feeling. 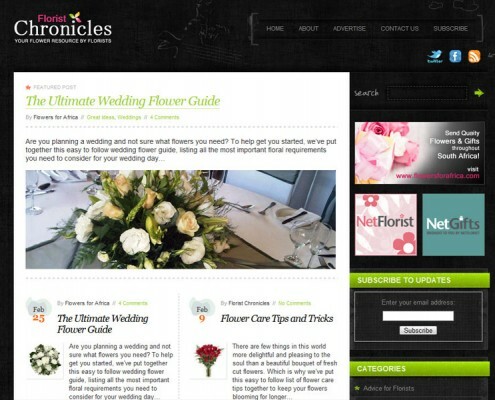 Florist Chronicles is an online content magazine publishing quality articles related to flowers and the florist industry. We needed to build a website that would look attractive, but that would also make a good publishing platform, and perform well with SEO. We also had to design a logo and other branding material. We chose to build the website using WordPress because of it’s superiority as a blogging platform, ease of maintenance and ability to expand using plugins etc. We designed a colourful logo that reflects the upbeat personality of the brand and website. We built the website with SEO in mind, and optimized the site every step of the way. We also integrated social sharing tools and an optin form to boost rankings and grow their audience. 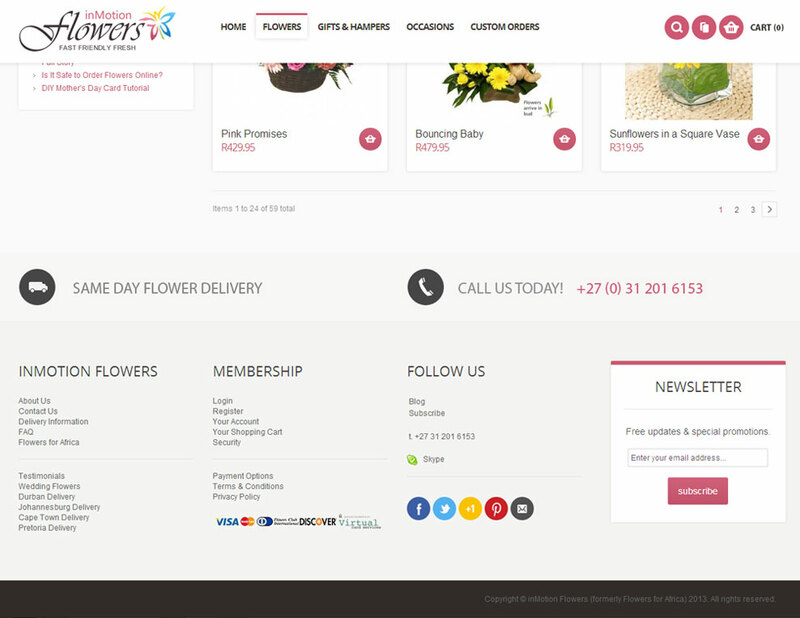 Develop branding, a colour pallet and design a logo for Florist Chronicles, a flower and florist magazine website in South Africa. We came up with a bright, cheerful colour pallet to convey the personality of the Florist Chronicles brand, and to remind of the colourful flowers that this website is all about. To further drive the reference to flowers, we came up with an abstract logo graphic that hints towards petals or leaves from flowers. We chose a font face that conveys a classy and somewhat educational feel, and added the bright colours to the logo to add a playful element to the logo. 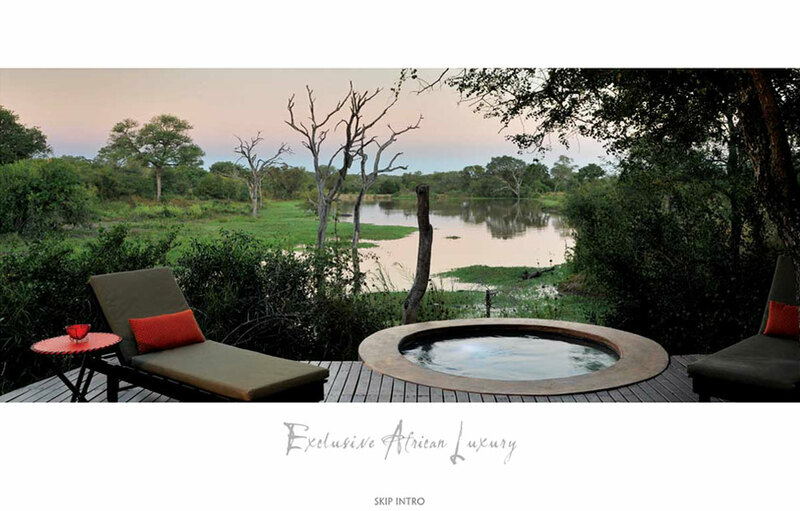 Djuma comprises a luxurious 5-star lodge and a quaint self catering camp in the Djuma Game Reserve in South Africa. 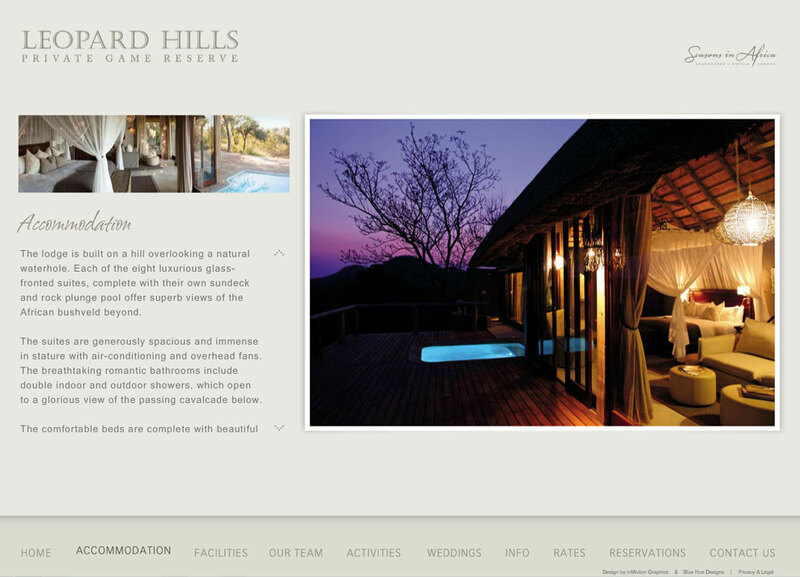 The brief was to build a flash website that would align with the other 5-star properties we built websites for in the Seasons in Africa portfolio. 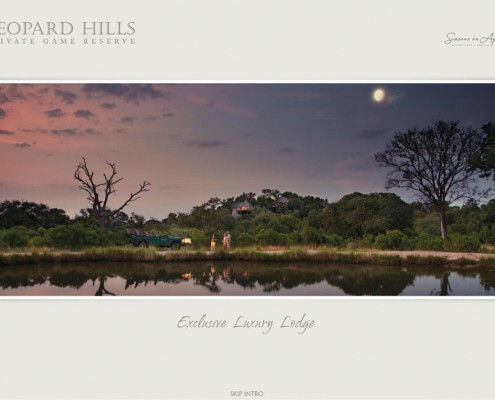 Gorgeous imagery that would sell the user on the beauty of the game reserve and lodge was naturally the primary focus of the website. 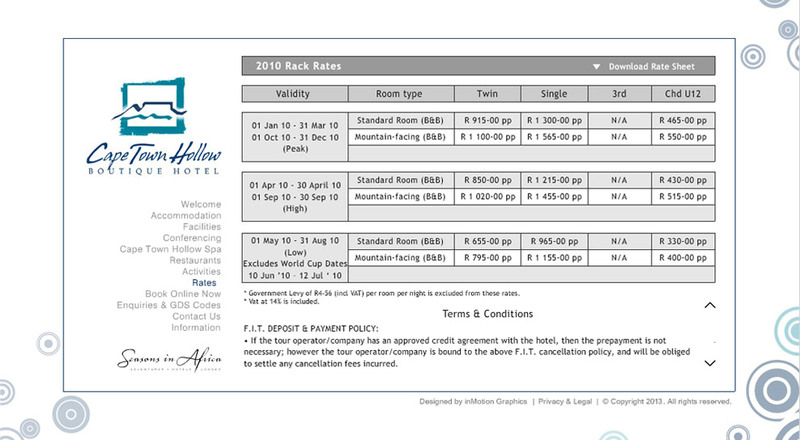 They also needed a contact form, reservation form and the website needed to integrate with their live booking system. Eventually we also needed to couple the flash website with a WordPress site to enable visitors on mobile devices to access the website, and to improve their SEO. Since images were to take centre stage on the website, and we wanted the site to be HD and fullscreen compatible, we chose to build the main site in flash. 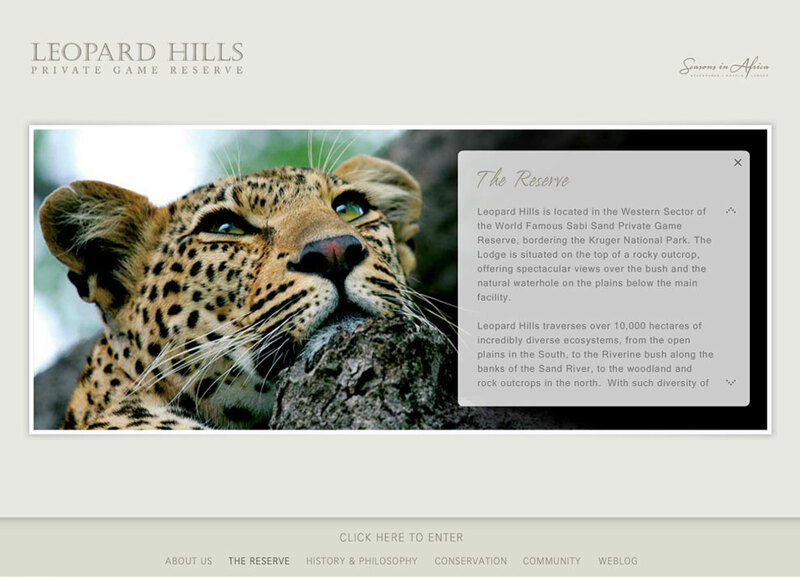 As with the Leopard Hills website, we built an elegant intro to grab the user’s attention from the get go. 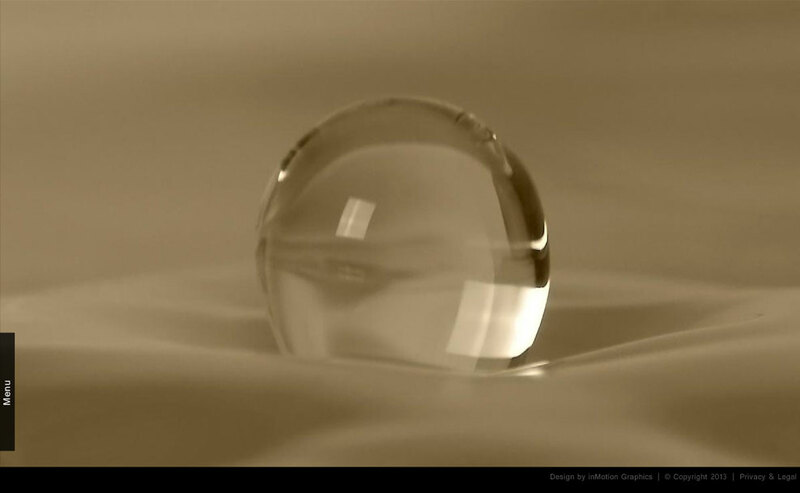 The intro included full width images and captions to set the tone. We used subtle animation throughout the website to create a feeling of continuity and developed a slick technique of loading the large images in a way that didn’t slow the website down. The website was also built to take up the full height of an HD screen, and then scale down to fit smaller screens. 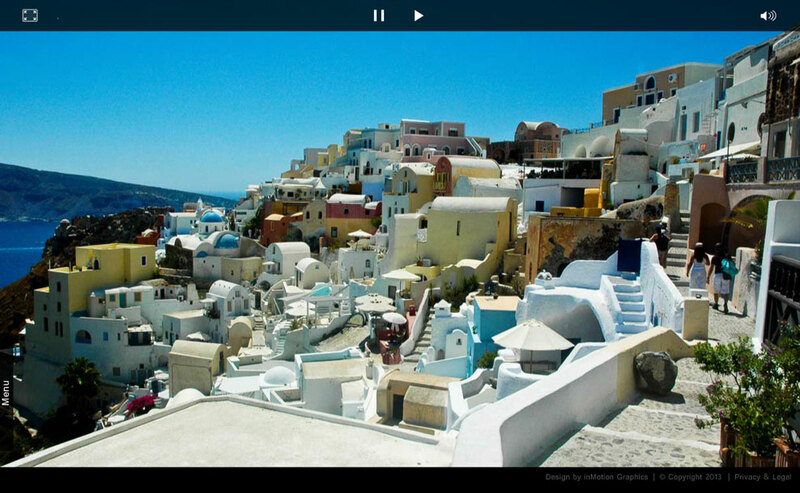 We also added a fullscreen button so that users on smaller screens could also get the full effect of the large images. To further distinguish the site from their competitors, we created an interactive map that can be zoomed in and out and navigated with a mouse. We also animated the route to illustrate the directions to the lodge in a unique way, and added clickable hot spots that link to the lodge and camp sections. 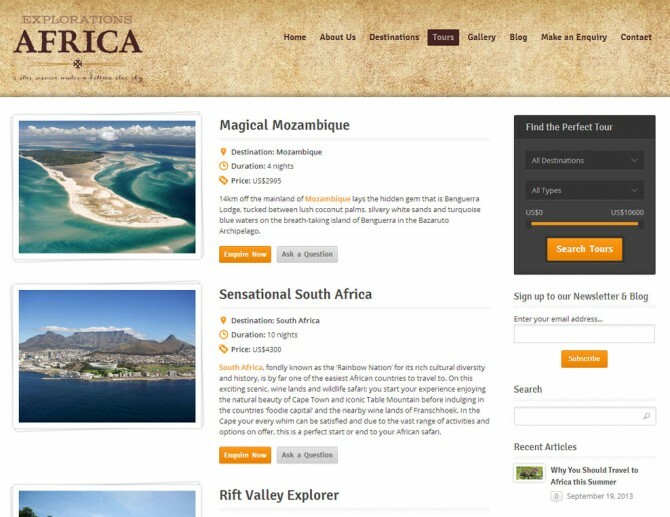 To make the website compatible on mobile devices and to improve their SEO and rankings, we later developed a WordPress based website and blog, which then became the main access point to the website with the flash website being used to fully explore the lodge from its best side. To help them grow their audience and engage with their guests more effectively, we added an Aweber auto responder to the website and integrated it into their blog. 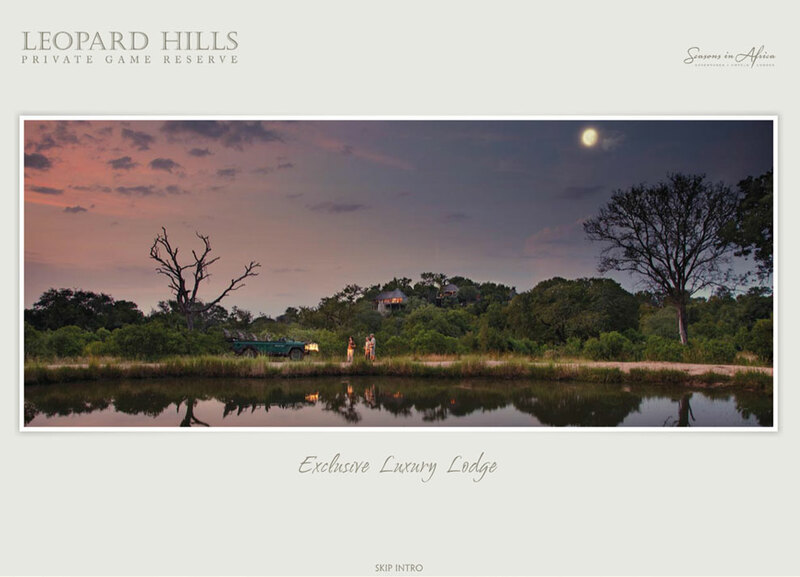 Leopard Hills is one South Africa’s most luxurious 5-star game lodges, and a truly magical place to be. 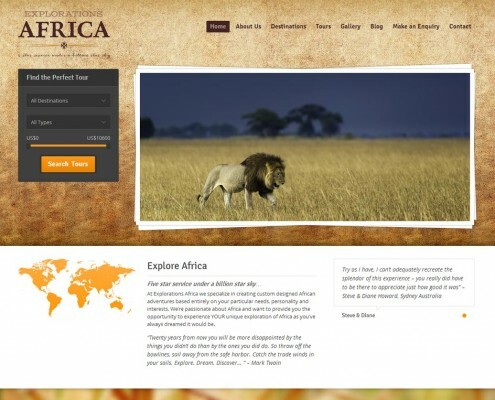 The brief from their marketing company, Seasons in Africa was to develop a website based on a design by Blue Hue Designs, a graphic design agency in Durban. 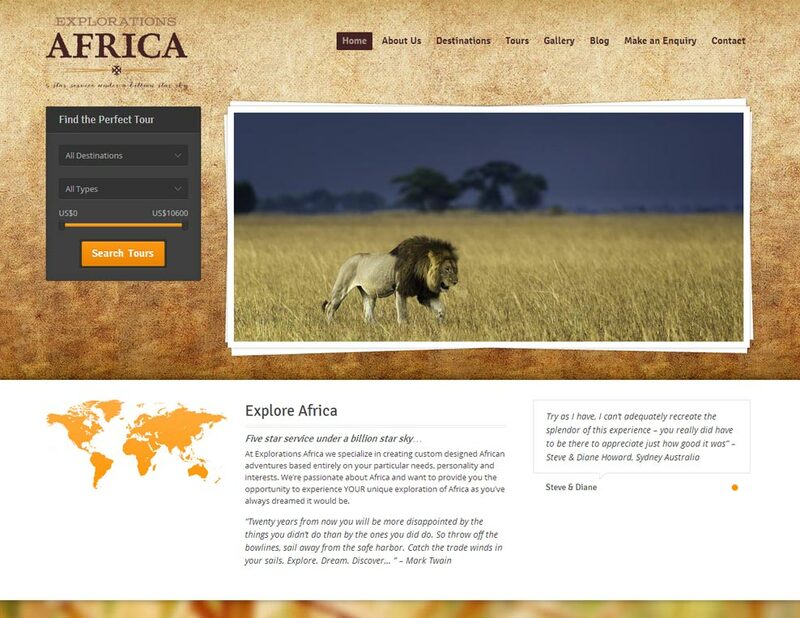 The website needed to be elegant, clean and convey the majestic beauty of the African bush and the luxurious accommodation through the use of stunning imagery and tasteful design. 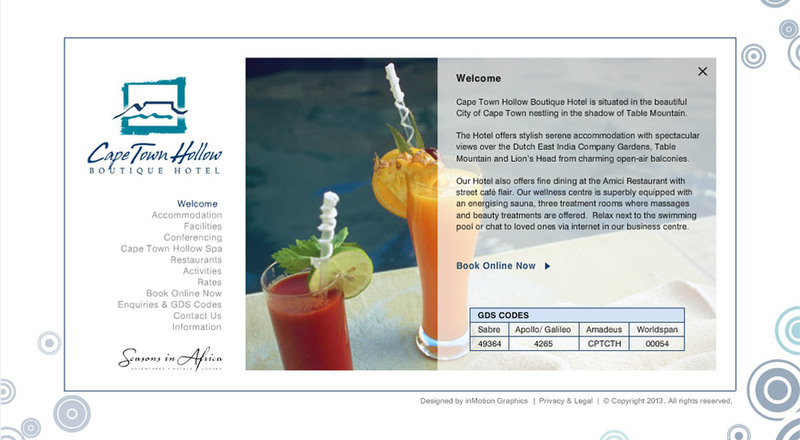 They also needed a reservation enquiry form, and the site had to be integrated with a live booking system. We knew that the site needed to make extensive use of imagery to convey the beauty of the lodge in the most effective way possible, so we chose to build the main site in flash. To grab the user’s attention right away and to set the tone, we designed an intro with full width images and animated captions to highlight the main features of the lodge. 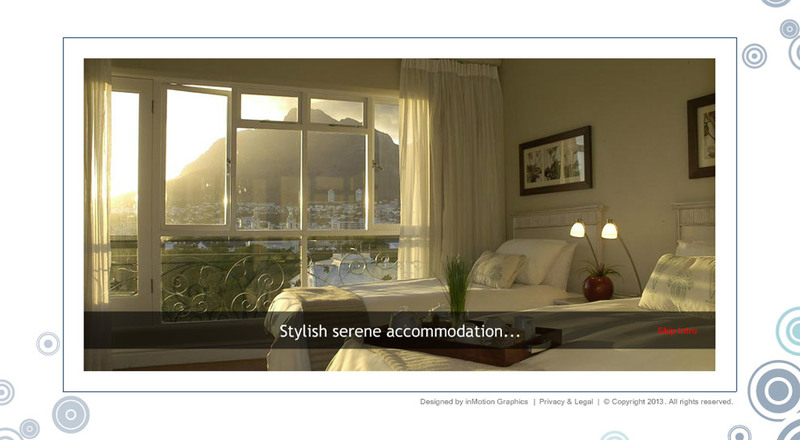 Through the use of subtle animation throughout the site, we were able to create a feeling of continuity. The user experience was further enhanced by ensuring that the site loaded quickly, despite the extensive use of large imagery. By only loading the first image to display a new page, and then loading the next image while the current image played, it doesn’t matter how slow the user’s connection is, they will never feel like they are waiting for images to load in the slideshows. To take full advantage of HD screens, we built the website so that it perfectly fits the height of a high definition screen, and then scales down to fit on any smaller screen size. We also added a fullscreen option so that users with smaller screens could still get the full effect of the large images. To further distinguish the site from their competitors, we created an interactive map that can be zoomed in and out and navigated with a mouse. 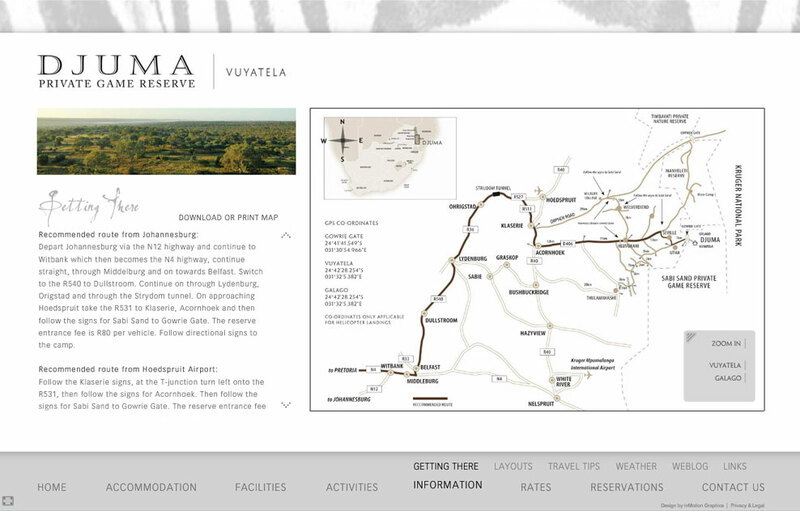 We also animated the route to illustrate the directions to the lodge in a unique way, and added clickable hot spots that link to content pages. To improve their SEO and rankings, and to compensate for the relatively poor performance of flash with the search engines, we built them a custom HTML, PHP and MySQL based blog. 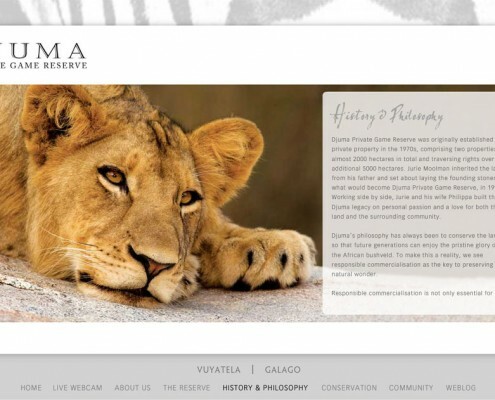 This not only helped drive targeted traffic to the site, but enabled them to communicate and maintain relationships with their guests before and long after their visits to the lodge. 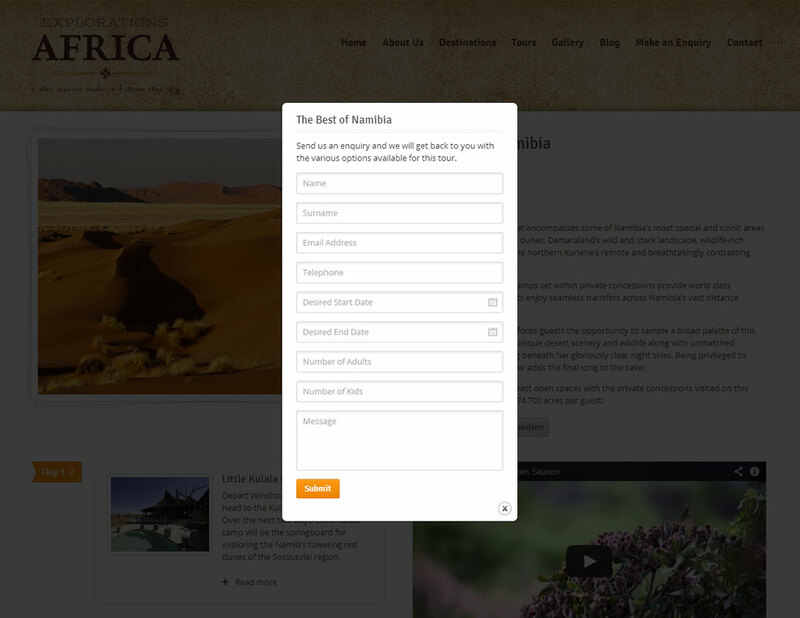 Guests also have the option of registering as members, and posting their own stories on the blog. 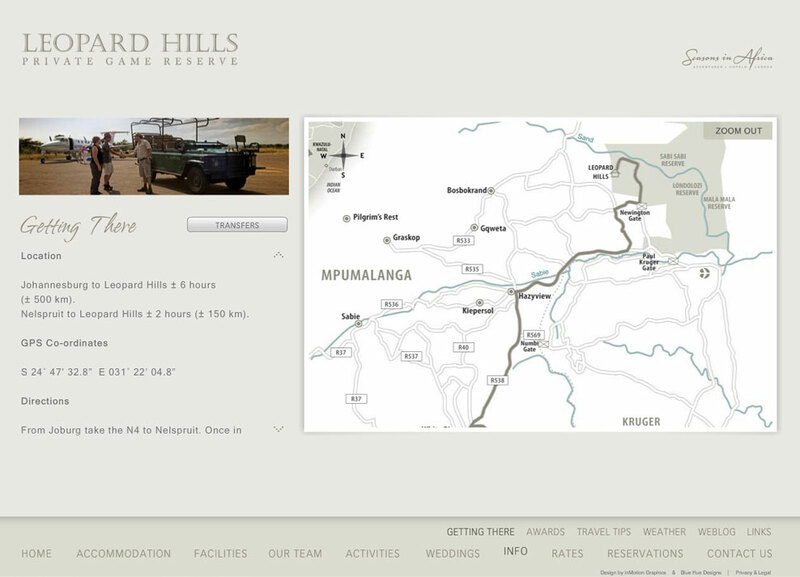 The entire website including all the additional features was custom built from the ground up to ensure it was truly unique like the Leopard Hills lodge. Desroches Island is a beautiful private Island in the Seychelles. The primary purpose of the website would be to showcase the beauty of the island in the most sophisticated way possible, and to market the 5-star hotel they’d built on the island. 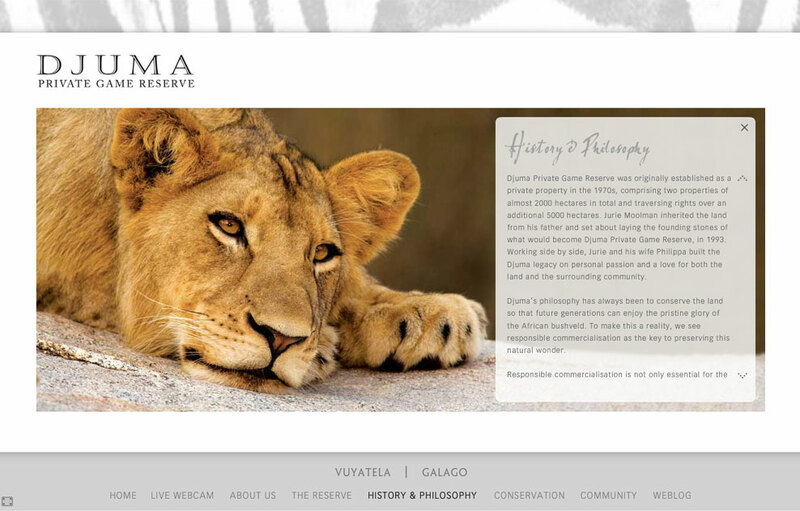 Additionally, they were selling villa ownership on the island, so this also needed to be integrated into the website. A reservation form would be required and the site needed to be integrated with their live booking system for the hotel part of the island, while the ownership site, needed an enquiry form. 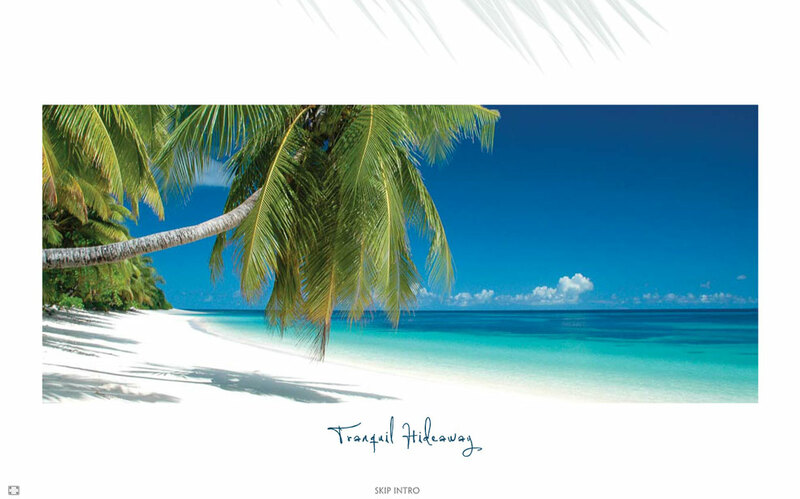 We knew that to get people to book a holiday to this luxurious island destination, we needed to make extensive use of their stunning images. 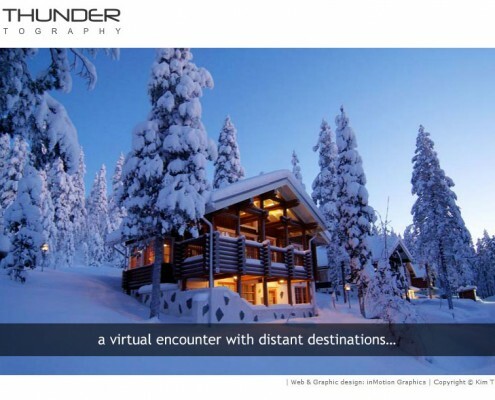 To achieve this, we chose to build the site entirely in flash at the time, which enabled us to create a stylish intro that would set the tone, and a unique interactive tour which enabled the user to navigate the entire island and the various properties on their screen. 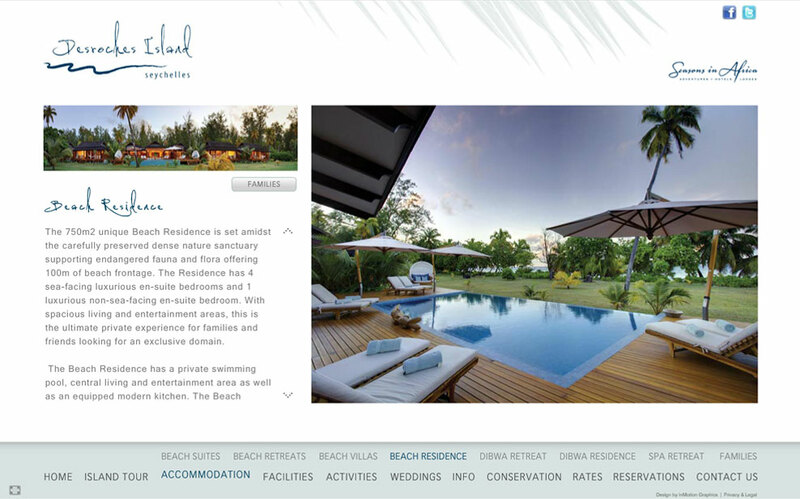 Since we had to integrate both the hotel side of the island and the villa ownership into one site, we decided to structure the website so that after the intro, the user lands on a landing page with general information about the island. 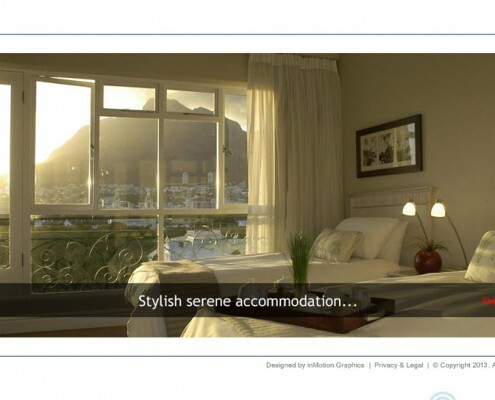 Then the user has the option to choose between “Island Accommodation” or “Property Sales”, and this would take them to an entirely unique menu structure, each with a home button to get back to the landing page. We created two unique Island tours, which serve as the entry point and alternative navigation for each sub site. 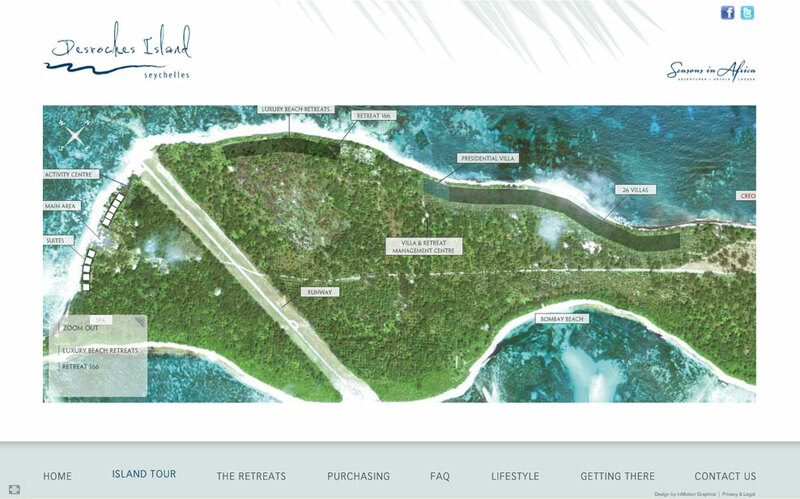 Our custom built interactive island tours became the focal point of each of the websites. 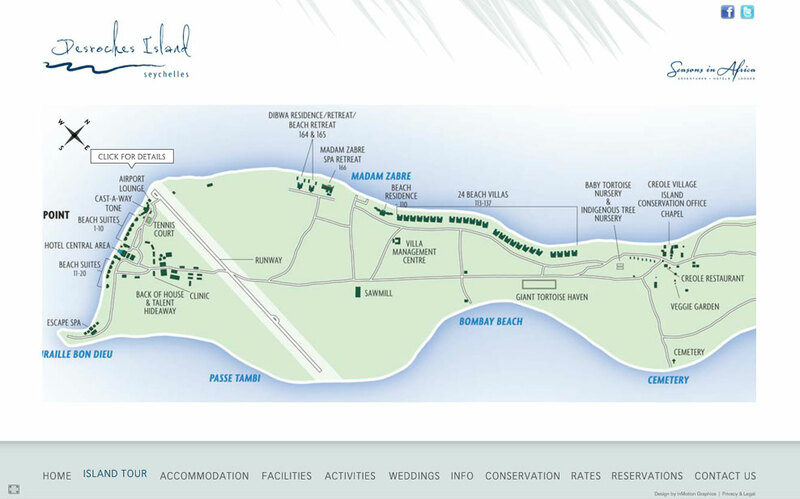 The user has the option to zoom in on an aerial view of the island, which displays the various properties available and highlights the features of the island. 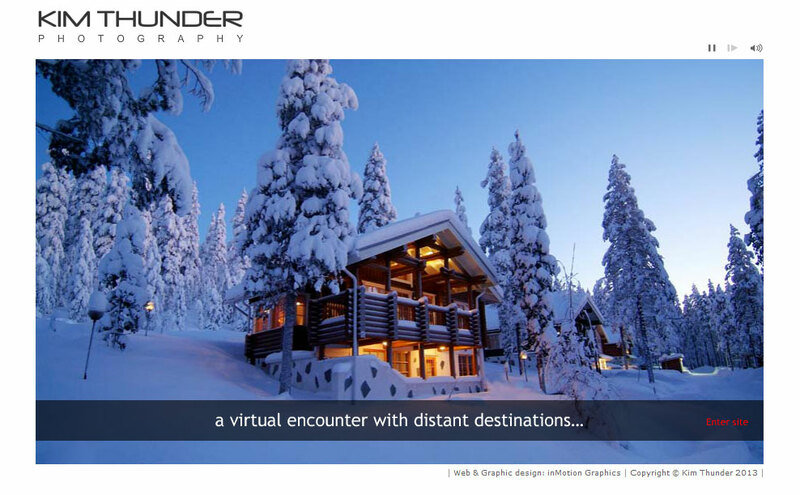 We made extensive use of sophisticated animation to further distinguish the website. 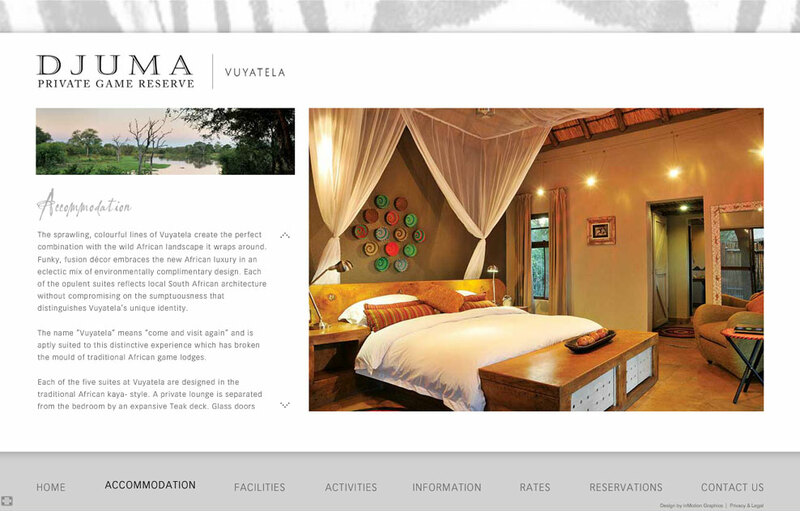 The user can then click on a villa or the hotel, which leads them to the respective accommodation pages. To further enhance the effect of the stunning images, we built the website to perfectly fit the height of an HD screen, and thus maximized the size of the images. To accommodate smaller screens, the website scales down to fit any screen size. We also built it in a way that ensures the user only ever waits for the first image to load, which kept the website fast, despite the use of large images. Then we included a fullscreen function so users on smaller screens could also enjoy the full effect of the large images. 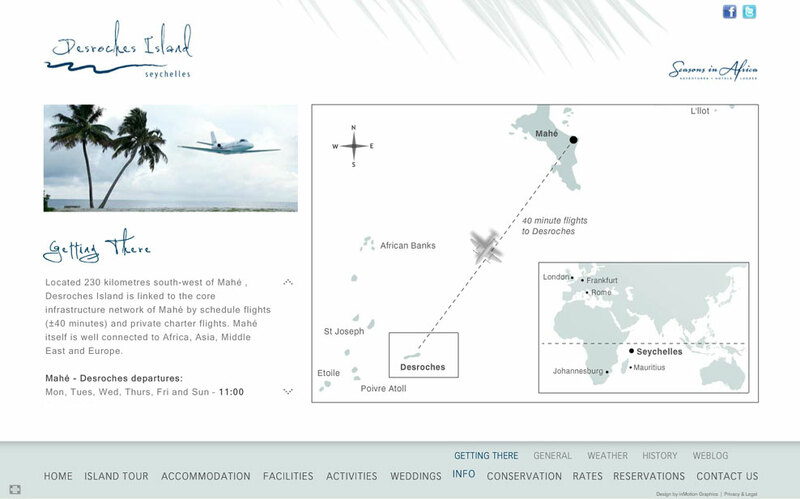 For the Getting There page, we built another interactive map, and added an animated aeroplane that flies the route to the island to add an element of fun to the site. To compensate for the poor performance of flash with the search engines and to improve their SEO, we built them a custom blog. This enabled them to build unique content and engage with their guests, and to post interesting story and photos about the day to day happenings on the island. Cape Town Hollow is one of the 4-star hotels under the Hollow brand, and as the name suggests, the hotel is located in Cape Town, South Africa. The brief by marketing company, Seasons in Africa, was to build a series of websites for the Hollow Hotel brand that would showcase the hotels from their best side. Each site would require a reservation form and be integrated with a live booking system. 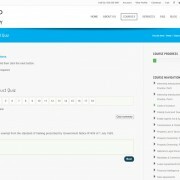 We built a unique flash website that maximized the size of the images by displaying text boxes over the image slides. This also saved the user having to scroll their browser. 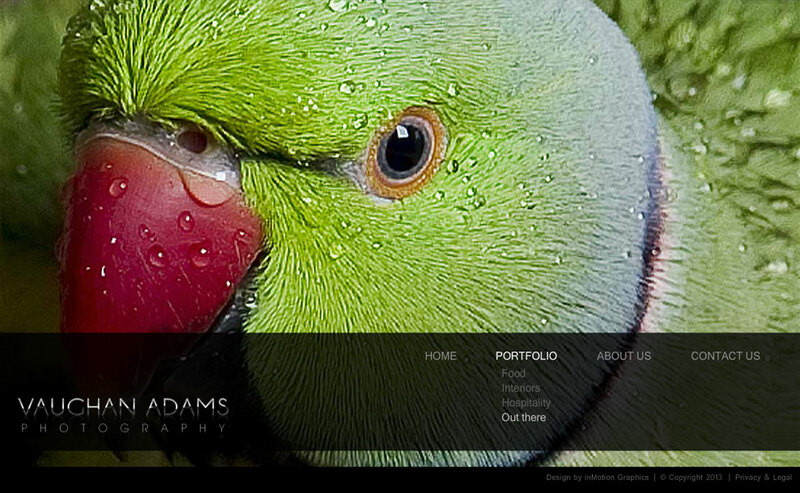 We also included an intro with full width images to set the tone for the website. The submenu was integrated within the images to save space and keep the layout clean and uncluttered. 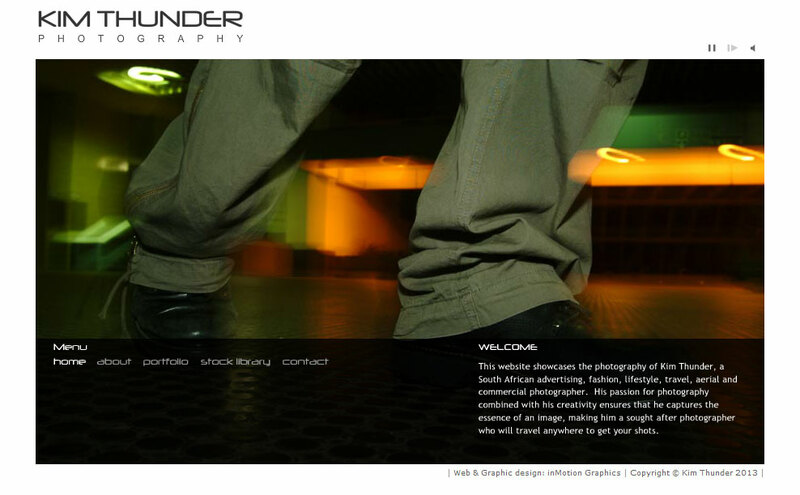 Kim Thunder is an internationally renowned food photographer in Durban, South Africa. 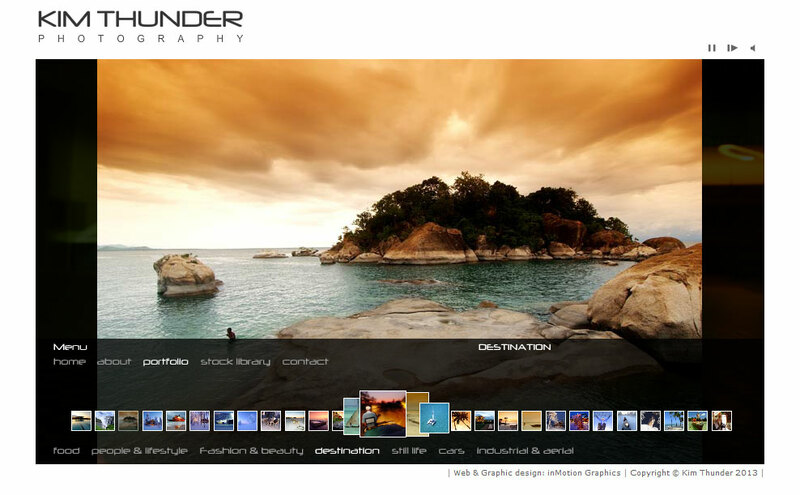 He was looking for a website that would showcase his creative photography in a unique way that was easy to navigate. He also needed us to design a logo for his brand and build a response form so clients could request a quotation. Naturally Kim’s photos were the focal point of the website, and we wanted them to take centre stage. So we designed a website that had no frames or borders that would waste valuable screen real-estate, and instead made the images themselves the defining container. We also got rid of the menu which would have taken space away from the images, and opted to display the menu over the photos when the user rolls the mouse over a hotspot. The various portfolio sections each contain a slideshow that can display an infinite number of images. To ensure the site loaded quickly despite the large images, we built it so that the user only waits for the first image to load. The next image then loads while the current image is playing. This way the user never feels like they are waiting for images to load, even though they may be on a slow connection. This was an important feature back in 2007. To make it easier to navigate the portfolio, we added a unique animated thumbnail strip that is automatically hidden when the user moves their mouse off the menu bar. This not only enabled the user to preview images and to skip directly to a particular slide, but also added a fun interactive element to the site. To grab the user’s attention right away, we included an intro with a selection of full-width images and captions, and to set the mood, we added a soothing sound loop in the background which can be muted in the toolbar above the slideshow. The slideshows in the portfolio sections can also be paused using the same toolbar. We purposefully tried to keep the website as clean and uncluttered as possible, so as not to detract from Kim’s photos. 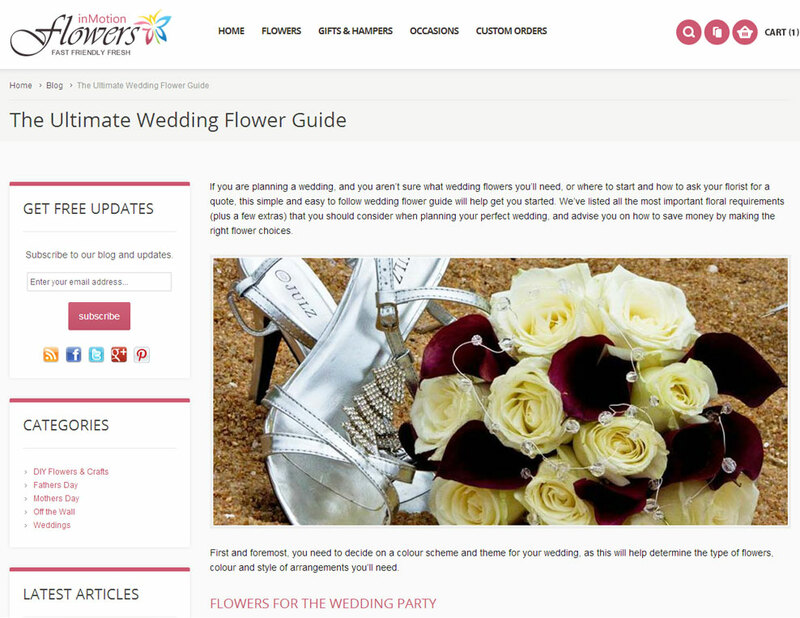 Florist Directory SA is a premium directory of florists in South Africa. 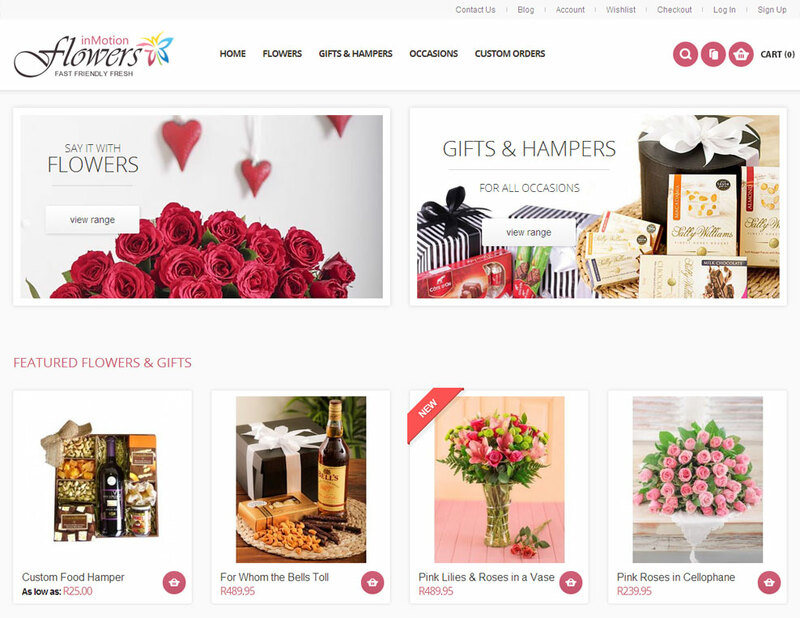 The website is specifically geared towards the rapidly growing mobile market, and aims to provide florists who don’t have a mobile optimized website or a website at all, access to this expanding online market. We needed to design a logo and develop a brand that would be well suited to the flower industry and that would work well on the mobile site. We designed a logo that not only conveyed the friendly and casual feel of the brand, but also had a touch of class at the same time. We did this by incorporating bright colours into the colour pallet, combining formal fonts with casual fonts, and adding a touch of shading to give the logo depth. To tie the logo in with the theme of flowers and florists, we added an abstract flower into the logo.